Wet misty morning viewed through cobweb to the lower terrace. My man and I woke early this morning, despite the fact that it is Sunday, and found thick fog obscuring our view down to the valley. We got in the car and my man said, “That’s interesting, we are one minute earlier than yesterday and four minutes later than the day before. Oh, and we have done eighty-eight thousand miles!” “Well, thank you for that….” I smiled. Don’t you just love him? Desperate to find sunshine, we drove further uphill to Fiano for our morning coffee. Hurrah, there was the sun, smiling down on this little hilltop village, so we relaxed, read the papers and greeted the locals, who were all dressed for Sunday, mostly in fashionable track suits. 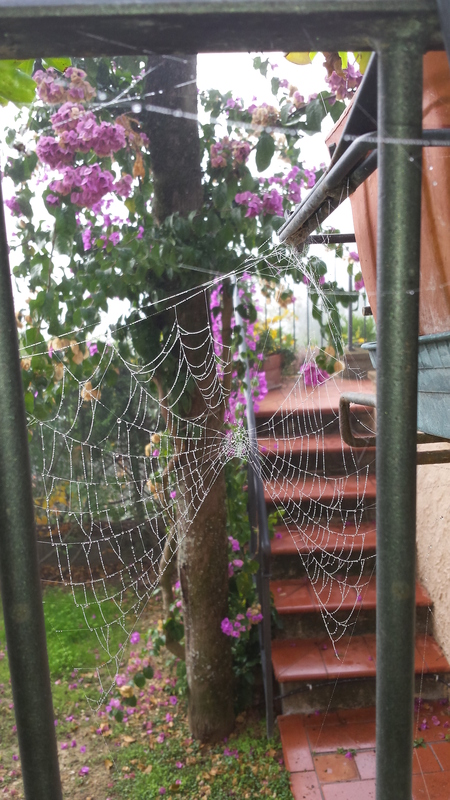 On our return to our little villa, we were still fog bound, however, my clever man noticed some incredible cobwebs and took a misty picture for you. autumn Vines through Paolo’s window. Wood fired grilled Porcini mushroom. Earlier in the week and before visiting a possible new property, we popped into Paolo’s Ristorante C’era una Volta, where Porcini Grilliata was on the menu. 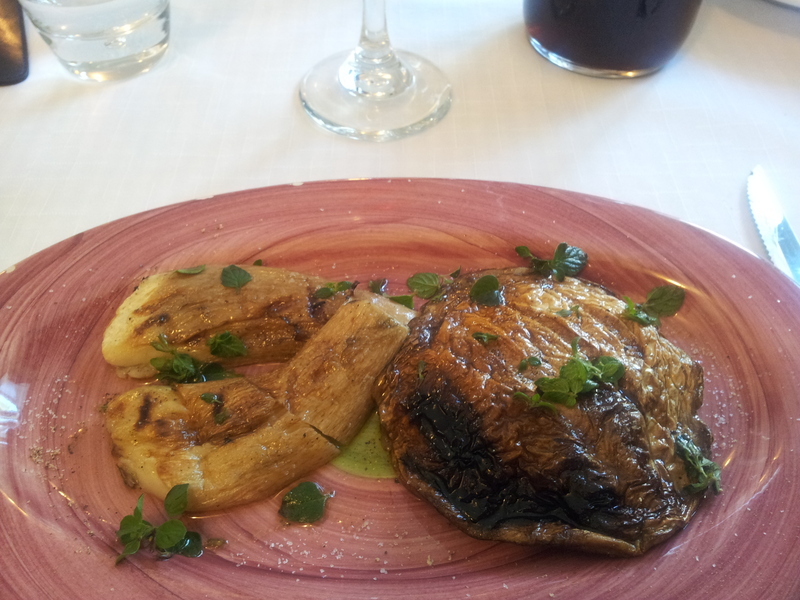 The larger Porcini mushrooms are really delicious if cooked over an open fire, which is how Paolo grills all his food. Yummy…. It was a lovely warm sunny day and we sat in the picture window where we could see the Autumn vines stretching away in all directions. My man glowed with contentment as his Pici alla Pecoraia (thick spaghetti in a pecorino cheese sauce with sweet baby tomatoes) arrived. I just love to see him enjoying himself! Daniel joins us for coffee. Phew! L Nazione. 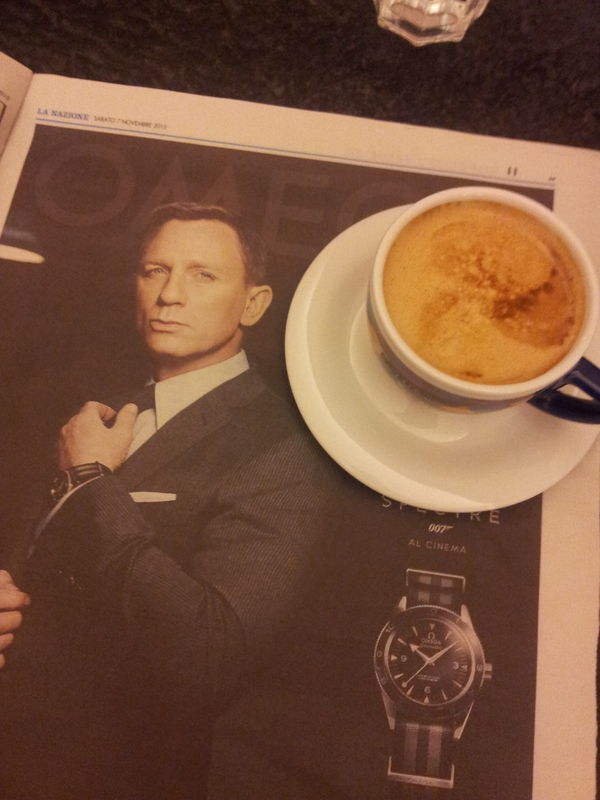 Then yesterday, Saturday, we dropped down to Certaldo and Bar Solferino for coffee where we were joined by Daniel Craig, looking absolutely gorgeous in Armani and flashing an expensive watch. Yes, I know, not really, but a girl can dream. We then went to see another potential country house that turned out to be an apartment with a shared garden; I don’t think so. So far I have viewed seven possible new homes, and we may have found the ideal place not far away from where we are now. Watch this space! Meanwhile, I am currently working away on an exciting ghost writing project. It is a thriller based on a real life story and is a fascinating and topical subject. But do not worry, you will not be forgotten and my weekly blogs will go out without fail. Also my monthly column in Expat Focus, the on-line magazine for, not surprisingly, expats! My book, ‘The Italian Connection’ will now hopefully be published by the summer of next year. Pre-lunch drinks on the upper terrace. 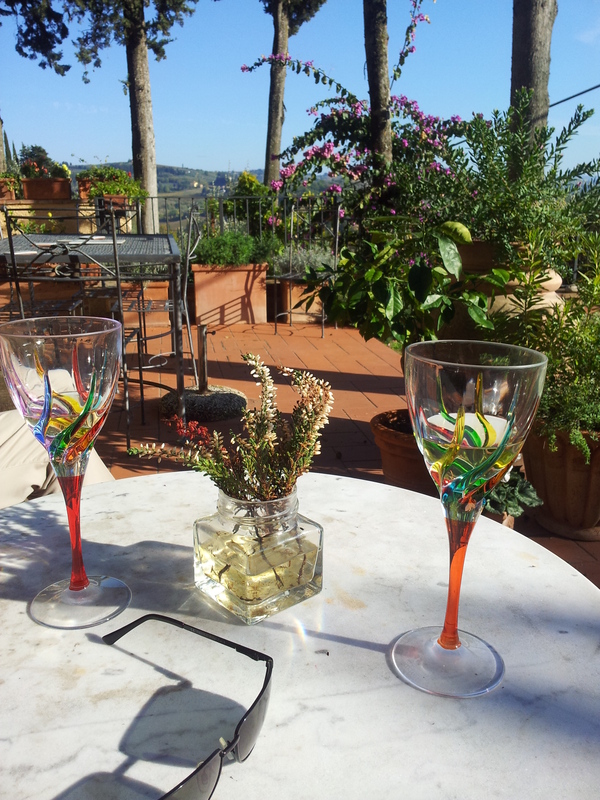 And finally, it is so important to have that relaxing aperitivo in the early evening. Also a nice drop of wine before lunch in the garden. We have been lucky enough to enjoy several lunches outside this week. When the sun comes out the middle of the day is quite hot, despite the chill in the air. I know, we are so lucky! Well must get on, more writing to do, places to go and people to see. English Park Benches on our upper terrace. 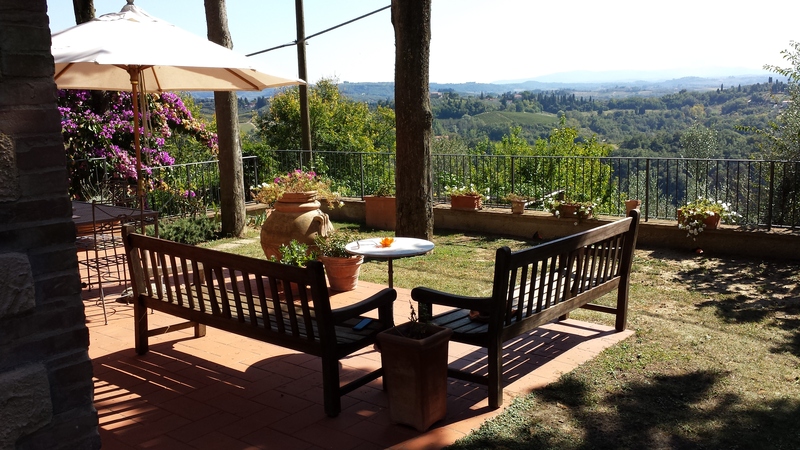 People who come to visit us for the first time, always ask where we got our lovely wooden benches that are carefully positioned to enjoy our panoramic view. Well, they are a pair that we bought in England back in the 1980’s and they have moved with us to every home we have lived in. So, ten years ago, they came with us to Italy and my man lovingly oils them every year and patches up bits of rotting wood with Sugru and other things. The bottom of the legs are vulnerable to damp so we keep them standing on small round and very hard pine cones. It would be a very sad day if we were to lose one of these treasures. Now I try not to talk about bad Italian drivers too often, as it is much the most common thing to mention, and sometimes boring. However, on Saturday morning my man drove us down to the market in Certaldo, which is thirty minutes in total there and back. Within minutes of starting out my man started to groan, then the expletives started. Now we rarely use the F word but this day it was warranted. I made a note every time my man shouted out to other drivers, pedestrians and cyclists on that journey, not that anyone could hear him from inside the car. OK, here we go. “What the f…; that cyclist didn’t even look!” “What the hell is that fecking idiot doing?” “Does that plonker have a death wish?” “Am I an fecking car, or what?” “Go on, back out why don’t you, I’m only a bloody car coming down the road!” “Get your dog on the inside, you idiot!” “Take your fecking time, why don’t you?” (to two women gossiping in the middle of the road and ignoring my man), “Look at that idiot, he’s right up his bottom!” “Oh, you’re turning right are you? What’s wrong with using your fecking indicator?” I may have missed a few. Needless to say, my man did not enjoy his drive, however, the coffee and pastry at Cafe Solferino in Certaldo was worth it! The smile was soon back on his face. 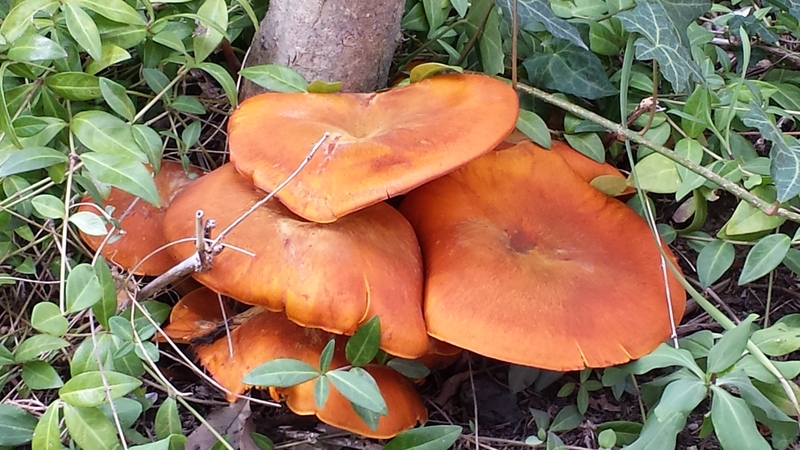 Inedible fungi in our garden. Last week was very wet, however, this brought forth some beautiful fungi in the garden and of course lots of Porcini are in the markets and veg shops. White truffles are still being found and the other day we spotted two truffle hunters and their dogs. Why, we asked ourselves, are they wearing camouflage clothes? Can the truffles see them coming without this gear on? The other thing is, there are shooters about, so wouldn’t it make sense to wear the same bright orange jackets the shooters wear, to avoid getting shot? But then I’m just a simple English girlie with, what I consider to be, a little common sense. But the Italians are very strange in the way they take risks, every year hunters get shot and killed, but hey ho! 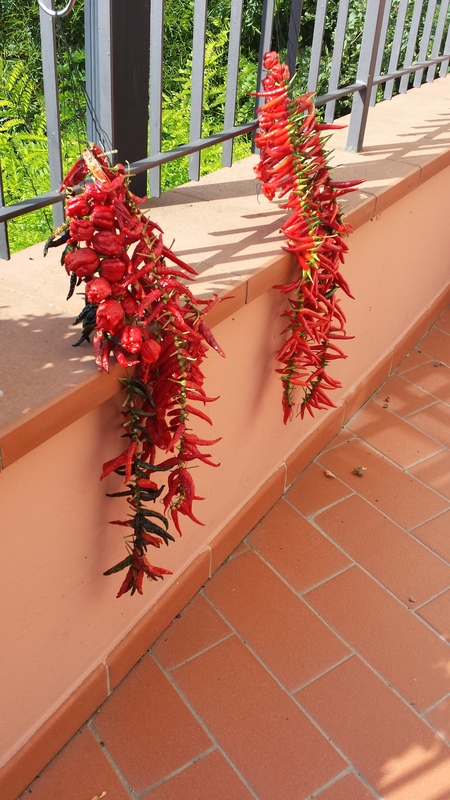 Hot Chilli Peppers drying on Paolo’s balcony. Back at ‘C’era una Volta’ ristorante, Paolo sold my man a small truffle (Tartufo) as he wants to take it to England today for a friend. It is now packed inside dry risotto rice in a sealed glass jar, which is also encased in bubble wrap. It’s not just protecting the truffle, it’s also trying to prevent the incredible pungent smell from creeping out into his suitcase! On Paolo’s balcony, where you can dine if the weather’s right, he has also been drying the most beautiful hot chilli peppers that he has grown in his own veg patch (Orto). Mmmmm. 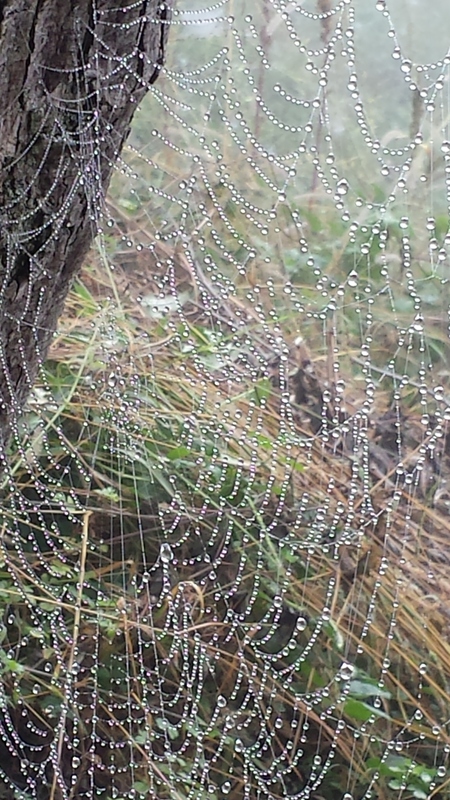 A jewelled cobweb in the early morning mist. Over the weekend, we have woken to a view of thick fog after the earlier rains and subsequent sunshine. As you know, we always go out for coffee in the early morning and yesterday spotted some wonderful spiders’ webs glowing in the fog, with tiny jewels of water droplets hanging off. Now what next? Ah yes, you are probably waiting to hear about Silvio Berlusconi’s latest exploits. Well, I have to tell you that I have just started reading his biography, so things are a little historical at present. Don’t sound so shocked, he is an historical figure, you know! Give me one more week and I’ll report, not only some fascinating snippets from the past, but also a complete up date.